Haha, thats great, I wonder how much thought he gave to trying to creep out potential customers. And I have to agree, fresh eggs like that just can’t be beat, they are simply far tastier than anything you can buy in the store. As for the egg dish, my mother used to make a similar one, only with the addition of blanched asparagus. Simply to die for. Fresh eggs are sooo much better than what’s in the grocery store. I use Joy of Cooking’s blender Hollondaise recipe and it’s never failed. At the risk of sounding completely inexperienced, I have to confess I’ve never tried fresh eggs. We buy the organic, cage-free, etc.. which might be close? But I am inspired now! I’ll keep my eyes open for the first opportunity! Ok, I love bacon. I really do. I even had a moment of thinking the idea of avocado and bacon ice cream on Top Chef was a possibly edible thing. I eat bacon usually only when I am out to eat—but I also do make a good strudel with sauerkraut and bacon, and a few other recipes with, say, cabbage and bacon. I love a good BLT. 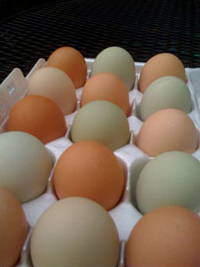 we have hens who will lay eggs, and their eggs are delicious :) we once had a variety of chicken which would lay the green kind, but usually we have brown. if you want one good brown egg laying hen who will keep a nest and not just lay anywhere try the black star. they will lay almost every day. Why didn’t you thin the sauce out with water?